closet and Tropical decor., large ceiling fan. Third Bedroom: Queen bed, built-in furniture,WiFi/high speed Internet connection inside/outside. and floor and glass-enclosed shower. All windows are new Impact resistant and sound lessening throughout. Helps make the new HVAC system more effieient. day! 75' of dock space - enough for two boats. Deep water canal with ladder for swimming access. table located in the downstairs recreation room, directly accessible from outside patio/dock area. Also includes 1/2 Bath, Large Laundry Room with high-capacity washer and dryer along with an upright full size freezer. Full wokshop area.New Hoshizaki 350lb Ice Machine a boaters delight. Plenty of room for boat accessories and tackle storage. This is our family winter residence where we dock our boat, fish, snorkel and explore the clear blue waters of the Florida Bay and the Ocean just a few miles away in any direction. Our canal is wide and full of wildife, Manatees, schools of mullet, and many species of fish. A short distance to either Tavernier Creek or Snake Canal depending where your fishing spots take you. 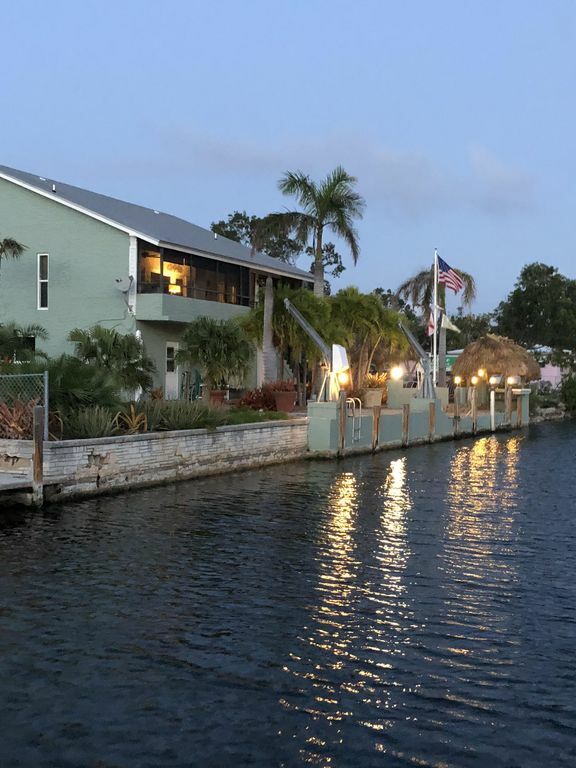 Our home is centrally convenient to local shopping, Cinemas, restaurants, bayside and oceanside, charter fishing, diving, marinas, all located within either walking or short drive from our home. Since our ownership, we have completely furnished, customized and upgrated all areas of our home, inside and outside for comfort and accessability for the casual lifestyle so familiar to the 'Keys' and this area. Our screened in porch serves as an outside family dining and lounging area anytime of the day or evening listening to the large palm trees in the breeze. Outside enclosed shower room with H/C and dressing area for privacy. This is a nice house. The kitchen has everything you could possibly need and the rest of the house is very nicely furnished too. Great dock space and we loved having an ice machine to fill up our cooler! Great Property supplying your every need when you are looking for a Keys Vacation Home. The owner Dee is fantastic! She is welcoming, accommodating & as a result of her keen attention to detail the property is equipped with all the amenities you can think of. I've stayed at the property 2 yrs. in a row and will make my annual vacation to this property every year moving forward. This home is in a nice location with fairly easy access to Atlantic water. Grocery and coffee shops nearby! The home is nicely furnished with plenty of accessories. The dock, canal, and fish cleaning station all a plus! The owner was very nice. The drawbacks are that the pool room is not accessible from inside the home, you have to go outside and downstairs - separate entry. Second, is the man living in the small apartment adjacent to the pool room - we didn't know about him until the second day. I would have liked to know that before renting/arriving at the property. Lastly, the stairs are tiled and when they get wet, like after a rain, they are extremely slippery! We had a wonderful stay at Dee and Gary's beautiful home in Tavernier. The house is clean, quiet, private and a great price compared to other similar locations/style/size. Any time we had a question, Dee always responded. Very friendly, and accommodating owners. We have thoroughly enjoyed our time here! We hate leaving! Can't say enough about the home, there are iguanas locally that we have befriended and feed breakfast to, saw a small shark and fish in the canal, too! Thanks for the tropical getaway, we will definitely stay here if we hit the keys again! What a great property! Minutes to anywhere and very easy to get to/from (which can challenging in the FL Keys traffic. The house is extremely comfortable and well-maintained. The patio by the canal is beautiful. The kitchen is ever cook's dream - definitely the best equipped rental kitchen I've ever been in. If you need a utensil or appliance, chances are Gary and Dee left it for your use. They new master bath is beautiful. The screen-in porch allows you to enjoy meals outside or simply to relax. The waterfront is large and very nice. The ice maker in the first floor is an awesome bonus. We really had a great holiday with our family and can't say enough great things about this property. We take pride in providing a comfortable homey atmosphere for all to enjoy during their vacation time in the Keys. water surrounded by beauty - not much more to ask for! Great restaurants to also cook your catch. Worldwide Sportsman, New Kayak launch ramp by Tavernier Bridge. check it out.